Hey. 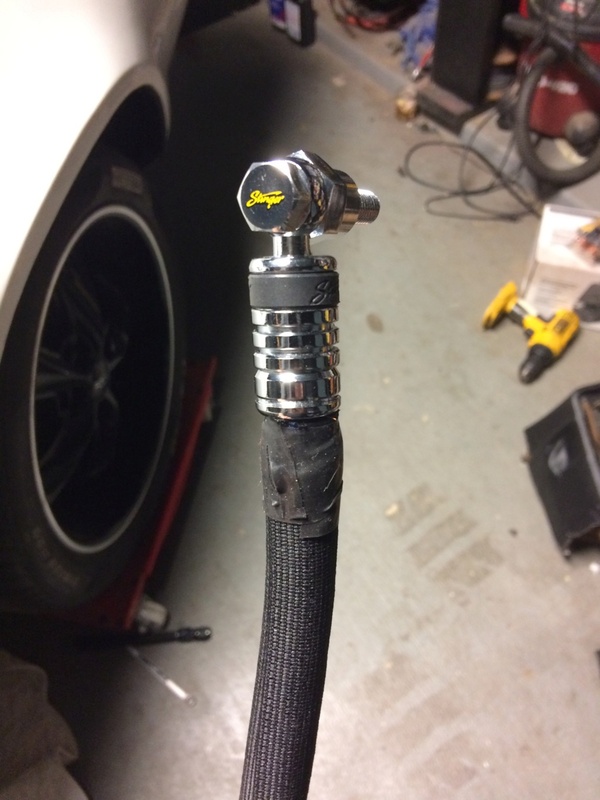 I paid $420 with the chrome moly yoke and u-joints. All is 1350 series. I get a good deal from the place I trade with. Shipping was $90. Ouch. Yes. Mine is shorter than what most would get because of the 6-speed. I told them that I might use a 150-200 shot one day and I had a 496 with a manual transmission and bad A$$ clutch. Not to mention 315 tires and 4000 lbs. Just be sure to spec out all 1350 yoke and pinion so you won’t ever have to buy another one. I painted it black. It’s on display in my garage on jack stands because I’m working 7 days a week. I saw it a couple of days ago. I was hoping it would install itself. Sadly they never do. But a little every day goes a long Way. 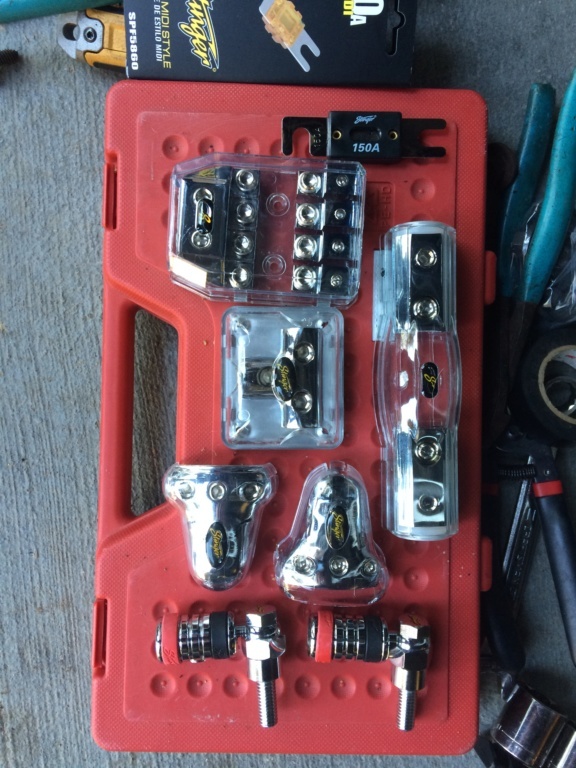 I also got my connectors and fuse holders for my wiring set up. I went with all Stinger items on this project. These will be mounted on the inner passenger fender next to the battery. Not even sure what that electrical stuff is, but it sure looks cool! Hope more parts find there way onto your car over the weekend. I've been told the Easter Bunny is a Chevy fan so maybe he'll throw on a few parts as well. I need a colored egg full of cash. I have been watching your other thread and I wish I could come help you. I need to get some fender shims. I got everything bolted up but I need to space them up just a tiny bit. I need to figure out where I can order them from. Other than that, I don't think I have anything else to really buy for the car. Did I just really say that??? We can always come up with more ideas about what to buy. Trust me on that. I've got plenty of shims for your fenders. I'll bring them down when I pick up those wheels you want out of your way. That is if you still have them. The wiring got started in earnest today. I put the battery tray in, set the battery in, and started making cables. 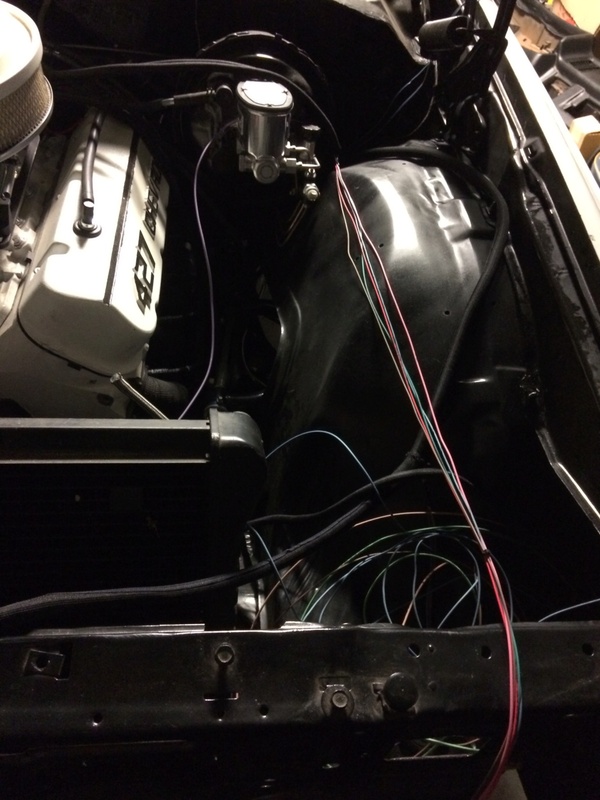 Made up the 0 gauge alternator wires for Batt and Ground (360 amp alternator), 0/2 main ground wire, and laid out the entire wiring harness under the hood. I am using DEI split loom wire cover for this project and it looks really good. Really can't take a pic because everything under the hood is so black. The white engine really pops. If I get a chance I will finish laying everything to it's end device tomorrow and maybe work on the inside wiring. I need to quit my job and finish this car. Pictures!!! We need more pictures!!! Got to keep the rest of us motivated. 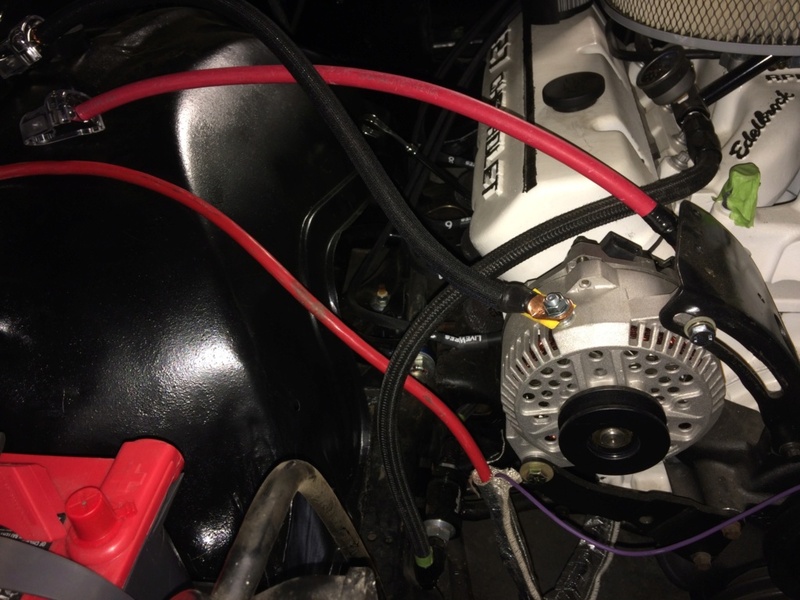 360 amp alternator? Holy crap that's some amps. It is a stout alternator for sure. I have 2 large amps to run and I am adding power windows and other items. I didn't want to run out of power. 1 amp requires up to 150 amps. That's more than the stock alternator. g3chevy, here are a couple of pics. You have to look close because the wires that are in the looms in these pictures blend into the background like a lizard into a bush. 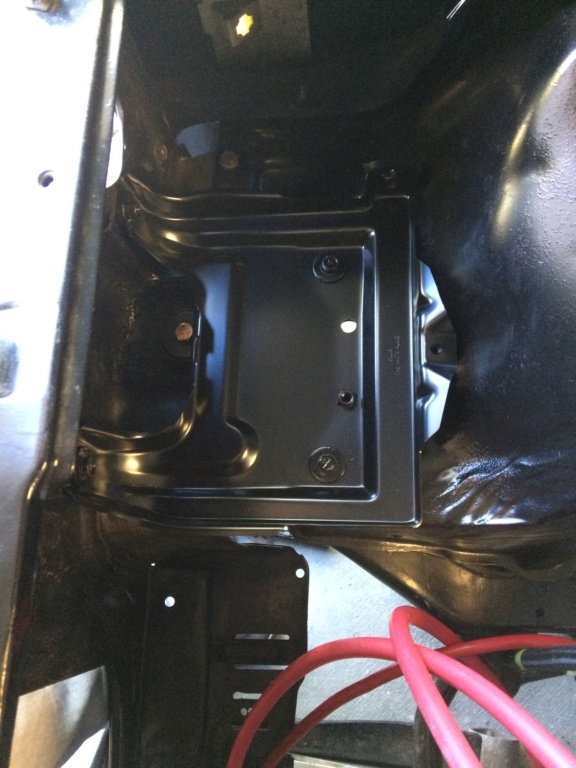 Battery tray I installed and them removed due to the bolts looking like old surfaced rusted eye sores. I wire brushed them and painted them. Now it's installed. Working on the main under hood harness. I have everything split out. Half of them are covered and going to the passenger side. 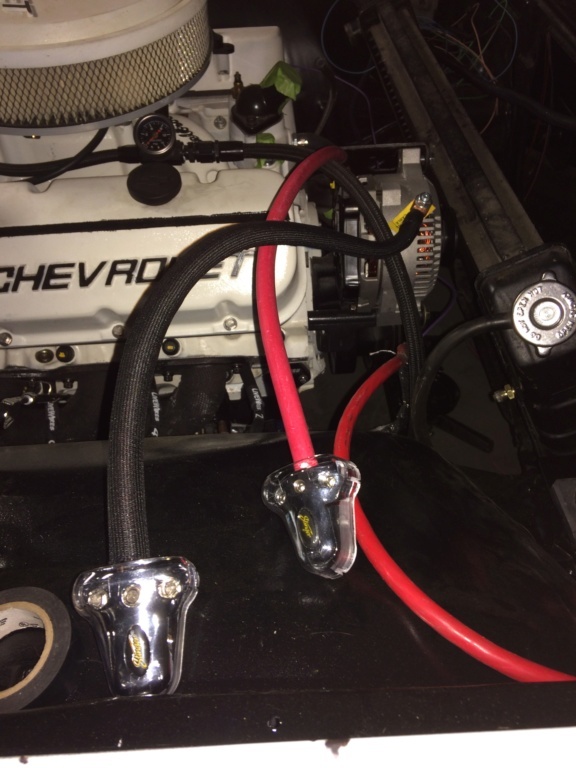 I have to tie in the starter wire with the new terminal block set up I have to build on the fender. Alternator to battery connections. I have lugs that screw into the lower ports of the battery for the main ground and power to distribution. 0/2 ground wire that will bolt into the side of the battery. I still have to make my positive one that bolts to the battery and goes to power distribution.